As Stanislaus County’s two public institutions of higher learning, Stanislaus State and Modesto Junior College have been partners — both formal and informal — many times over the last six decades. 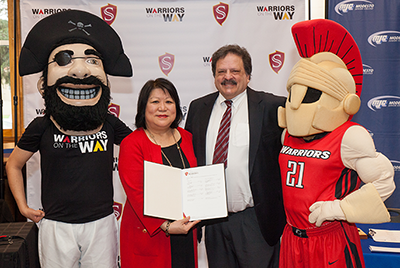 In a ceremony on Tuesday, March 5, on the MJC campus, that partnership took a bold step forward with the signing of a Memorandum of Understanding (MOU) to create a clear path for MJC students to earn their undergraduate degree at Stan State. The MOU promotes MJC’s associate degrees for transfer (ADTs) through the “Warriors on the Way” (WOW) program and symbolizes a renewal of the institutions’ commitment to work together to smooth the transfer process for MJC students. A major part of this agreement calls for MJC to designate a space in the college’s Transfer Center to house Stan State staff, while Stan State is agreeing to provide an academic advisor to be available at MJC up to 40 hours per week. Future plans as stated in the MOU include encouraging conversations on curriculum between the faculties of the two institutions to ensure articulation of relevant courses. The agreement with MJC is a part of Stan State’s continuing mission to forge formal relationships with the community colleges in the University’s primary six-county region. Last year, an MOU created a pathway in which students at San Joaquin Delta College would be able to complete four-year degrees in selected fields of study on Stan State’s Stockton Campus, eliminating the need for relocation or lengthy commute to the Turlock campus. These MOUs with community colleges are part of Stan State’s core mission to providing access to higher education in the region.